The late Chris Hellinger was about as colourful a character as one could hope to find among the wine-farm owners in the Cape Winelands. 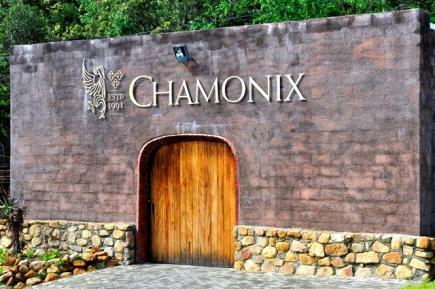 Among his life’s achievements, about which one could write an impressive, vivid and action-packed book, was the overseeing of Chamonix – a farm he purchased in the mountainside of the Franschhoek Valley – becoming a piece of premier wine turf. The spread originally fell under the La Cotte farm, one of the earlier viticulture endeavours the French Huguenots undertook after hot-footing it to South Africa in 1688, and Chris bought his slice of the wine dream in 1991. When Chris passed away at the end of last year he would have done so knowing that, as far as wine went, he really did his best. 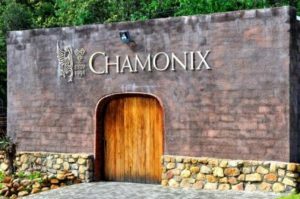 Today business on Chamonix carries on for the Hellinger family under CEO Stefan van Rooyen and talented young winemaker Thinus Neethling. Having developed a serious Chardonnay urge last week I popped in to get a hold of some tastes of the variety Chamonix has become especially known for. The other is Pinot Noir, a glass of which was seldom absent from Chris’s side whenever I had the pleasure of encountering him glaring at one from behind dark aviator sunglasses and wearing a black leather jacket that looked like something from the set of a Marlon Brando movie. I decided to forego the unoaked Chardonnay, sticking to the standard Chardonnay 2017 to be followed by the Chamonix Reserve 2016. 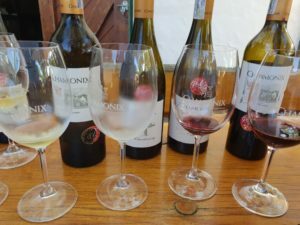 Sitting under ancient oaks on a very – and apt – Germanic-looking wooden bench tasting good white wine is one of life’s greater gifts, and the wines were up to the moment. The Chardonnay 2017 is fermented and aged in French barrique, 30% new, and kept on the lees for about a year. The approach is simple and traditional, allowing the wine to really expressing the sites of the vines lying over 300m above the level of the ocean and covered with Greywacke soils bearing a hefty clay component and some serious limestone. The flavour-line runs with citrus and apple blossom, some tanginess and grip on the mid-palate – those clay soils, man – before the finish is typically sunlit and sweet-fruited. A beautiful, clear and mannered wine this is, being approachable and friendly but providing some thought-provoking engagement. As it should be, the Chardonnay Reserve 2016 is another animal all together, elevating the class of the first wine into something stratospheric. Spontaneous fermentation is done in wood where 75% is matured for 14 months while the balance goes into concrete Nomblot egg. Texture is the major difference here. The Reserve has the same degree of luminous seduction as the first one, only here the wine lies on the palate like a regal clipper sailing-ship compared to the standard Chardonnay’s surf-ski briskness. There is a firm presence on the palate, immediately leading one into the Meursault realm of crushed, hot autumn chestnuts, lemon meringue and iced Cuban lime juice. 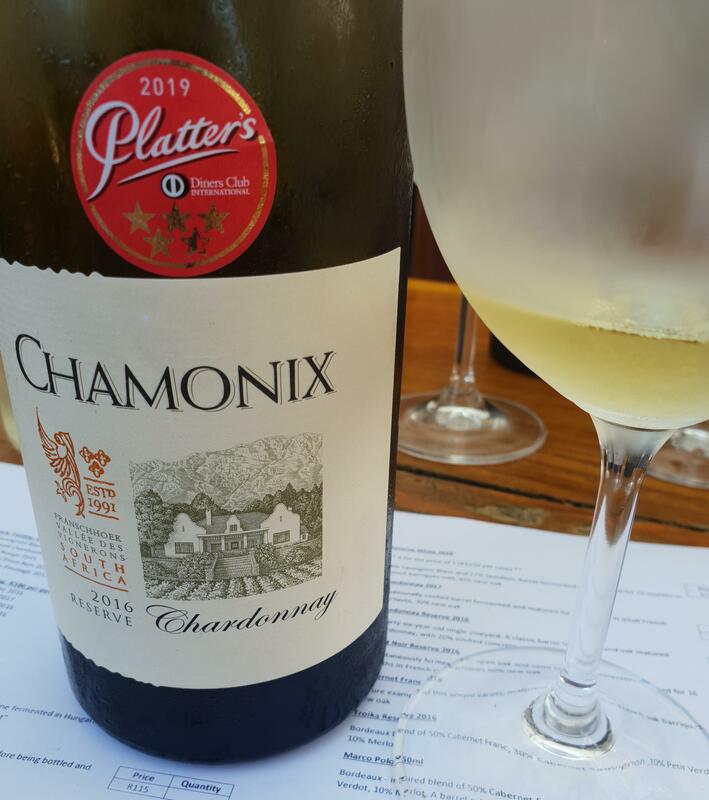 This is the kind of Chardonnay that demands a bit more time in the mouth, the heat of which further opens the flavour-chest allowing burnt butter, green fig and ripe kumquat to present themselves. The finish is longer than a Jimmy Paige guitar riff, and once the music stops you just can’t wait to get going again. Heading to the reds, a noticed a westerly breeze picking up, the oaks swaying with uneasy creaking sounds. 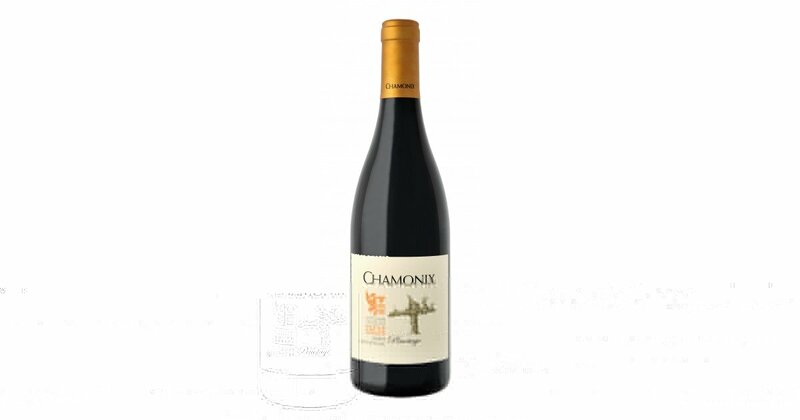 I headed for Pinotage, not Pinot Noir, and found the Chamonix Greywacke Pinotage 2015. Although not having entered the domain of great Pinotage recognition yet, this wine has for my taste and to my liking got to be right up there. Grapes are picked in batches, beginning in February with the healthy ripe bunches, leaving the rest to get further hang-time and develop a bit of air-dried concentration. Whole-bunch fermentation is complemented with the addition of the later, partly dried grapes. Malolactic fermentation is followed by maturation in French oak 225s, some 30% being new. For a full-on 18 months. The journey is complex and intricate, but it’s truly worth it. The colour is purple-black with a rim the colour of the blood of a just-shot Cape buffalo – something Chris Hellinger would have known about. On the nose I got potpourri and all sorts of sappy, juicy stuff including the juice that runs out of the dish after you’ve baked a plum pie. The wine is sensual on the palate, gentle and coaxing, with a delectable array of tastes ranging from prunes, sour cherry, just-grated nutmeg and that delicious touch of liquorice. At four years of age, this wine is absolutely stunning in a deliciously tasty and rewarding way, vindicating the brilliance of the 2015 vintage. And the special quality of Chamonix wines.